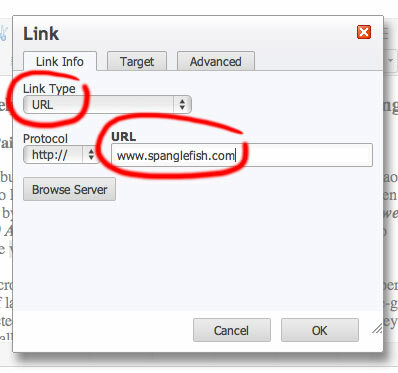 Links which enable users to jump from one site to another are one of the most useful features of the web, and Spanglefish makes adding these to your site pages easy and quick. 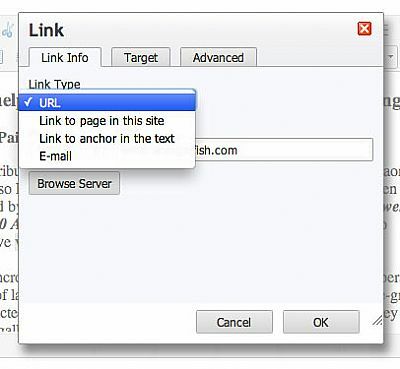 Adding a text link pointing to another web site . .
1) Navigate to the page of your site where you want to add a text link. Click on the 'Edit Page Text' button to enter editing mode. 4) Enter a 'URL' (a web address complete with www.) into the URL field. 5) OPTIONAL: if you want the linked site to open in a new browser window, whilst keeping your own site open in the original window, then click on the 'Target' tab. Then select 'New Window' from the Target drop-down. 6) Click 'OK' to confirm and close the pop-up. 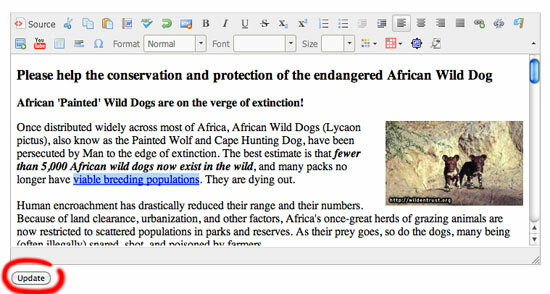 7) In the text editor you will now see that the highlighted text is also now underlined, indicating that this is a link. Click on the 'Update' button below the text box to confirm the editing. Add a link pointing to another page on your own site - follow the same steps as above, but then at step 4 . .
4) Click on the Link Type drop-down. By default this is set to URL. 5) Select 'Link to page on this site' from the drop-down. 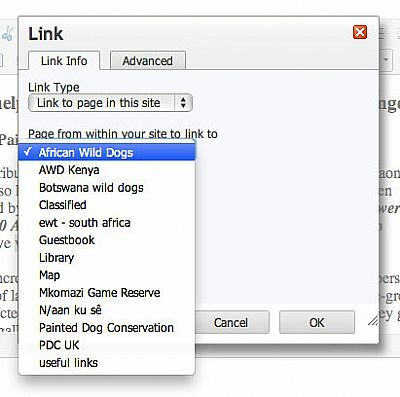 6) On the Page list drop-down which appears, select the name of the page that you want to link to. 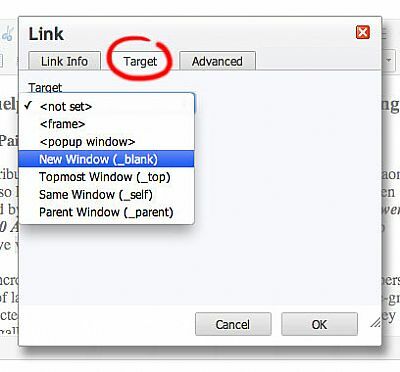 7) Click 'OK' to confirm and close the pop-up. 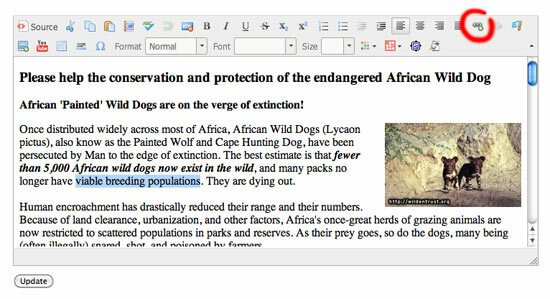 8) In the text editor you will now see that the highlighted text is also now underlined, indicating that this is a link. Click on the 'Update' button below the text box to confirm the editing. 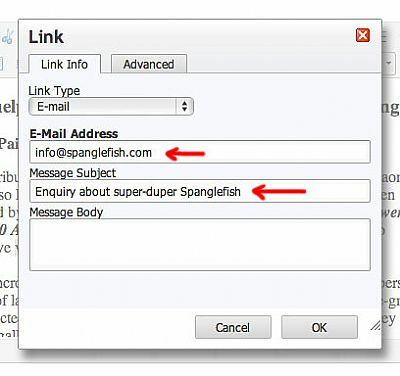 A link which, when clicked, opens a pre-addressed email message on your computer - follow the same steps as above, but then at step 4 . .
5) Select 'E-mail' from the drop-down. 6) In the E-Mail Address panel which is now displayed, enter the email address that you want messages to be sent to, and a subject line for the message. (It's a good idea to have a clear subject, such as 'Enquiry via Ye Olde Oaks Bed & Breakfast website' so that when you receive the enquiry you know which site the user was viewing when they sent it. You can link to documents such as PDF's which you've uploaded to your Manage Documents tab. View this page to see how.